Flour mixture – Combine 375ml flour and 250ml water and MIX THOROUGHLY with a whisk. Pour into a spout bottle using a funnel. Ensure that the bottle is closed properly. TIP: A home hair colour kit’s spout bottle works very well, just wash and rinse thoroughly. 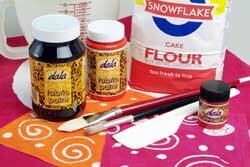 Trace your design onto the fabric with the flour paste mixture in the spout bottle. Hold the spout bottle at an angle while tracing. TIP: Cover your working surface with plastic and not newspaper, as newspaper tends to stick to the fabric when wet. For solid areas, trace circle design (slightly bigger than a dinner plate) and apply flour mixture with spatula to cover the entire inside circle. For border – just drop flour mixture at random to achieve “spots” around the edges. TIP: The thicker you apply the flour paste, the coarser the cracks. Allow to dry for at least 24 hours (depending on the thickness of the flour). As the flour mixture dries, the fabric will “shrink”. To achieve the “cracked” effect on the solid circles, you need to roll the fabric, (only over solid circles) and squeeze. You will hear the flour cracking. To crack the swirl design, pull the fabric straight. Paint the solid circle first. TIP: Apply paint with a wet brush, this will allow the paint to soak through the cracks. Paint the swirl design with a brush. Paint background with a sponge. Allow to dry thoroughly. Remove the flour with a blunt knife. Another, rather messy alternative is to first heat set the fabric, then soak the fabric for a few minutes in warm water in the bath. This will make the flour soggy. Scrape off with spatula and rinse off excess flour. Remember to let the hot water run for a while to prevent the drain from blocking. CHAIR COVERS TO MATCH: Follow the exactly the same procedure as for the tablecloth. Paint covers with alternative colours. SERVIETTES TO MATCH: Have fun doing swirls, small solid circles and “spots”. Just drop mixture randomly, or use the flour mixture in the spout bottle. Paint serviettes with alternative solid orange and cerise for a mix and match effect. Heat set the fabric in the tumble dryer for 45 minutes on high. Or in the oven. Set temperature at 130 degrees. When ready, place fabric (painted side folded in) on the middle shelf. Bake for 15 minutes, turn off the oven, open the door and allow the fabric to cool in the oven. This item has 760 views.